H shares have lured many international investors to Hong Kong over the past two decades but the mainland issues have lost out to the blue chips on the Hang Seng Index in recent years. 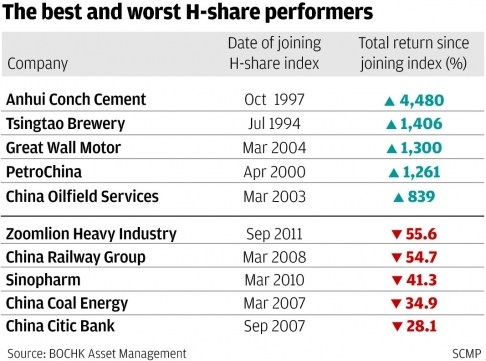 The Hang Seng China Enterprises Index or H-share index, which tracks mainland firms listed in the city, generated a 4.77 per cent annualised return from the listing of the first H share, Tsingtao Brewery, on July 15, 1993, to the end of last month. In comparison, the Hang Seng’s annualised return, with dividends reinvested, was 9.11 per cent. “H shares have underperformed. It is getting more difficult to market dedicated H-share products as, although it was a unique asset class 20 years ago, it is now an underappreciated one,” said Paul Chan, the chief investment officer for Asia ex-Japan at Invesco. But people who invested in Tsingtao Brewery can still celebrate by opening a beer to toast Monday’s 20th anniversary of its listing, with the beer company the second-best performer among H shares, with a 1,406 per cent gain since it was added to the H-share index in 1994. Joseph Tong Tang, an executive director of Sun Hung Kai Financial, said when H shares were first introduced, investors did not have much interest in them because the mainland economy was only just starting to take off. “The H shares and other mainland stocks were only chased by investors when big players such as China Mobile listed in the late 1990s and when Big Four mainland banks Bank of China and Industrial and Commercial Bank of China listed in 2005 and 2006,” Tong said. There are now 176 H-share companies listed in the market. Chan said it was unlikely that H shares would ever dominate the market again because the listing of state-owned enterprises in Hong Kong had peaked in 2005 and 2006, with all the biggest state-owned mainland banks and insurers already listed. As such, fund managers need to be selective, focusing on certain sectors to find the stars. “We anticipate those sectors which continue to enjoy dominant market share in China and are immune from competition, such as banks and energy companies, are likely to be the stars,” Chan said. Huang Shumin, an investment manager at JP Morgan Asset Management, said fund managers needed to be selective in finding winners in the sector. “While the banking sector faces the challenges of reform, some still report decent profits. Likewise, in the property sector, some developers are doing much better than others,” Huang said. Elvin Yu, the managing director and head of institutional business in Hong Kong for Allianz Global Investors, said: “We continue to focus on bottom-up stock selection in order to make money for our funds in this sector. “As long as we find companies that demonstrate cash-flow growth and good dividend return, these are names that we can make money from. Marc Desmidt, the head of Asia-Pacific Alpha strategies at BlackRock Asia-Pacific, said H shares would continue to be a crucial avenue for global investors to gain exposure to Chinese equities. “Health-care and industrials are two sectors where we see long-term growth potential,” Desmidt said. “There is an undervalued long-term demand for health care in China due to the ageing population. “Investment-led growth will also continue to be a significant driver of Chinese economic growth, and companies in the industrial sector will be beneficiaries of this trend.